Richard Franklin was a Lieutenant in the Rifle Brigade before becoming an actor and joining RADA in 1963. After leaving RADA he worked for a time in an advertising agency. He then worked for the Century Theatre appearing on stage mainly in Shakespearean roles. Television appearances include The Saint, Dixon of Dock Green and in 1966 Crossroads. He then spent a year and a half with the Birmingham repertory theatre. In 1970 he appeared in the BBC antiques show Going for a Song. After Doctor Who he had a small part in Blakes Seven and was a regular in the YTV soap Emmerdale. He returned to the role of Mike Yates in the 20th anniversary special "The Five Doctors" in 1983. He also wrote and starred in The Doctor Who spin off play "Recall UNIT" for the Edinburgh Festival Fringe in 1984. Joining UNIT as a sergeant, Mike Yates initially worked as part of UNIT’s ‘clean-up crew’, making sure that any alien technology left over after UNIT operations against the Nestene Consciousness ("Spearhead From Space") or the Silurians ("Doctor Who and the Silurians") was cleared up, until he met the Third Doctor and Liz Shaw when he was directly assigned to UNIT HQ about a year after The Doctor joined UNIT. Having proven his worth when he helped The Doctor, Liz, The Brigadier and Sergeant Benton save the world from conquest by insane actress Nancy Norton in a reality that they themselves accidentally created by travelling back to the past ("The Eye of the Giant"), Yates was promoted to Captain following a confrontation with C-19, a renegade government department collecting alien technology, Benton - although the more obvious candidate given his longer time with UNIT - recognising that Yates was better suited to the political aspects of the promotion than he would be ("The Scales of Injustice"). Having received the promotion to second-in-command of UNIT, Mike quickly demonstrated a different outlook to military life compared to The Brigadier. Mike had very modern ideas and had very little time for military protocol, including saluting, much preferring to get on with the job in hand with casual efficiency. Although The Brigadier had faith in him as a soldier, Mike still experienced some difficulties in his position at times, such as his first experience at independent command - The Doctor having been temporarily transferred to Russia to investigate alien activity there while The Brigadier went to Geneva to explore recent evidence that suggested corruption in UNIT -, resulted in UNIT being infiltrated by the CIA under the command of the mysterious Control, Benton nearly being killed by a bomb that had been planted in The Doctor’s lab, and losing Britain's supply of cobalt-60 when the CIA tried to undermine a British attempt to trap the invading Waro, although his colleagues recognised that circumstances were all outside Mike's control and Mike himself vowed to do better next time ("The Devil Goblins From Neptune"). Despite his awareness of his responsibilities, Mike was generally easy-going and made his courage clear more than once. He was also very rarely phased by anything, neatly summing up The Doctor’s description of the threat facing them when trapped in the village of Devil’s End as an alien that could be ‘either too small to see or thirty feet tall, can incinerate you or freeze you to death, turn stone images into homicidal monsters and looks like the devil’ ("The Dæmons"). Regardless of the threat facing him, Mike was always willing to stand up for what he beleived in, once even defying orders when The Brigadier and Benton fell under the influence of the mysterious Ragman - Mike apparently slightly protected from its influence as he was still slightly 'off-balance' after a recent assault - to investigate an alternative connection to the current crisis despite The Brigadier's orders to remain in their current location, buying The Doctor enough time to identify and defeat the Ragman's power ("Rags"). He was well respected by the troops and especially Sergeant Benton, generally trying to treat his men with respect for their personal qualities rather than automatically issuing orders simply because of his higher rank, although he was willing to use it when his relationship with The Doctor’s female assistant Jo Grant was concerned. Despite this he and Benton respected each other and they made a very effective team, to the point where Mike was once ashamed when he asked Benton to collect a file for him when there were other soldiers available to do the job even if Benton didn’t mind taking the order ("The Devil Goblins from Neptune"). This was very noticeable during one of the occasions when they were trying to defeat The Master and were trapped in the village of Devil’s End by a heat barrier while The Brigadier and the rest of UNIT were on the other side, leaving just the two of them to help The Doctor and Jo before The Brigadier and the rest of the troops can arrive at the village ("The Dæmons"). Despite being a soldier he did have a very sensitive and romantic side to his nature and he cared very much for Jo, so much so that on a number of occasions he was there for a shoulder for her to cry on when she felt hard done by. He enjoyed her company both while on and off duty even though occasionally he teased her. They were generally good friends, even though Mike would have liked his relationship with Jo to go further, but they were occasionally interrupted by other matters, such as Jo accompanying The Doctor on a supposedly brief test flight of a seemingly-repaired TARDIS that took them away from Earth for several weeks ("The Curse of Peladon" and "The Face of the Enemy"). On one occasion Jo and Mike were set up on a blind date with each other, but the date itself never happened as they invited The Doctor to join them and he offered them a trip in the TARDIS instead, resulting in Mike being temporarily brainwashed when they arrived on the planet Nooma during a conflict when he was actually killed by the natives, falling under their control as a zombie-like being until The Doctor was able to restore him to life ("Speed of Flight") (It was later implied that Yates was with The Doctor and Jo when they subsequently visited Karfel - their original destination - and encountered Magellan, a scientist who would become the Sixth Doctor’s enemy the Borad ("Timelash")). Whether this had any significant impact on their later relationship is unclear, but available information suggests that they had no dates after this. Mike worked best as a free agent and he relished in the task of being an undercover agent to infiltrate Global Chemicals. However, this did lead him to have a few problems when he was hypnotised by BOSS, a megalomaniac computer seeking to control the world ("The Green Death"). Although The Doctor was able to break BOSS’s conditioning, after a period of leave to recover from his experiences, Mike continued to suffer from mental difficulties, being sent on lighter missions to ‘ease’ him back into operations with UNIT. During one of these missions, Mike encountered the Fifth Doctor while investigating events in a small village - the Third Doctor being currently off-planet - ("Deep Blue"), although the two worked well together despite Mike’s confusion at The Doctor’s explanation for the out-of-sequence encounter, and The Doctor’s knowledge of Mike’s future actions, exposing the presence of the alien Xaranthi as they tried to transform the village population into human/Xaranthi hybrids to rebuild their society, although Mike’s later instability may have been ‘aided’ by the fact that he was forced to kill several hybrids when they threatened to attack others before The Doctor could cure the transformation. Increasingly pushed to the brink, and seduced by the peace he experienced while visiting uninhabited areas of the planet, Mike went on to become involved with Operation Golden Age, a plan to turn back Earth’s history and erase all but a few of the human race. On returning back to duty he not only betrayed UNIT and The Brigadier but also endangered The Doctor’s life when he used his position as a trusted and loyal member of UNIT to sabotage The Doctor’s equipment - although he had briefly tried to convince his superiors in Operation Golden Age to ask The Doctor for help rather than killing him -, his actions also endangering The Doctor’s new assistant Sarah Jane Smith. 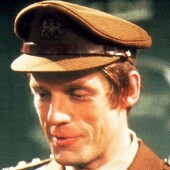 After he was exposed, and because of the unfortunate circumstances, The Brigadier arranged for the misguided Yates to be given a period of extended sick leave and the chance to retire quietly, recognising that his present actions didn’t negate the person he’d been in the past ("Invasion of the Dinosaurs"). Mike was later given a unique chance at redemption when he invited Sarah Jane Smith to the Buddhist meditation centre which he was staying at, alerting UNIT and The Doctor to the existence of a group at the centre who have been in contact with the Giant Spiders of Metabelis 3 who were attempting to increase their mental powers and so free their Great One. It was during the Giant Spiders attack that Mike is injured and then cured by K'anpo, the Buddhist meditation centre's leader, who also turns out to be not just another Time Lord but The Doctor's former Time Lord Guru, K’anpo assuring Yates that he still had a good heart before he departed to regenerate ("Planet of the Spiders"). Mike’s last televised appearance was as an illusion created by Rassilon to ward off the Third Doctor during the 1983 20th anniversary story "The Five Doctors", Mike appearing with an illusion of Liz Shaw at the same time, although The Doctor saw through the deception. In other media, the Fourth Doctor spent some time with Mike in the early twenty-first century when he was ‘between companions’ after Leela left him ("The Invasion of Time") and before he could finish building his new K9 ("The Ribos Operation"), Mike responding to an advert in a paper that seemed specifically addressed to him, encountering The Doctor’s housekeeper Mrs Wibbsey in a small house called Nest Cottage. Although The Doctor had no memory of placing the ad, he nevertheless told Mike about his fights with a mysterious race of telepathic hornets that had been haunting Earth for centuries, the hornets preying on the darkness in men’s hearts to take control of them as part of their plan to take control of Earth until The Doctor had managed to contain their hive in various stuffed animals. Although the hornets tried to prey on Mike’s inner darkness to convince him to help them, manipulating his inner resentment of the impact The Doctor had had on his life when he knew so little about the Time Lord in the hope of using his contacts in the government to expand their ability to control Earth - The Doctor realising that they had influenced him to place the ad to lure Mike in -, The Doctor was able to break the hive queen’s influence on Mike long enough to escape their hive, shrinking the queen down into nothing and trapping the hive in a stuffed zebra that he could destroy. ("Hornets' Nest"). During a later encounter with UNIT in the seventies, the Seventh Doctor learned that Mike had rejoined UNIT after some time recovering from his past issues, but was now working undercover in terrorist organisation Black Star, who believed that they were being secretly brainwashed by government signals in various broadcasts (Ironically, while they were correct about the purpose of the signals, the signals had actually been created by The Doctor’s old enemies the Vardans ("The Invasion of Time") in alliance with the Meddling Monk ("The Time Meddler")). At the conclusion of the fight with the Vardans and the Monk, although he eventually sided with The Doctor and his old colleagues, Mike resigned from UNIT, explaining to The Brigadier that he had come to sympathise with Black Star’s ideals about government suppression of information even if he objected to their methods. He met The Doctor again in 2010 when he was invited to the wedding of The Doctor’s companion Bernice Summerfield in the village of Cheldon Bonniface ("Happy Endings"), during which it was revealed that Mike had ‘come out’ and was now involved in a relationship with another man (Although it was never specified if he was gay or bisexual). The character of Mike Yates may have started out small but he grew in importance and as he played more and more key roles he was eventually considered a companion.